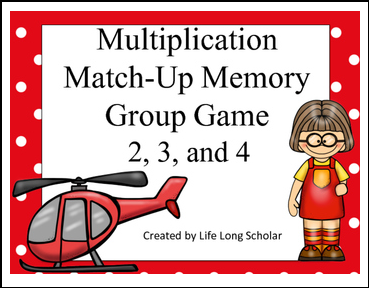 A great way for students to learn/practice the 2, 3, and 4 multiplication facts. Hands on math center designed to help students learn and retain facts in a fun way. Helpful for a math center that engages students and keeps their attention because of the game component. Requires teacher prep work to cut out the squares but there are lines between to make cutting easier. For best quality print on card stock. For extra durability laminate. I encourage my students to use a multiplication grid (if they don't know the answer mentally yet) as an answer key if a fellow student wants to check that the student flipping has the correct answer.